Why are there 5 chicken emoji but no #DinosaurEmoji? Elders of the internet, we need a #DinosaurEmoji. And we need it now! Everybody loves dinosaurs! It's a global (pop culture) phenomenon in almost all countries and age groups. Dinosaurs are the highlights of natural history museums around the world and attract millions of people every year. Several animals have two (or even more!) Emoji. Now it's time for dinosaurs! In many languages, »being a dinosaur« is a common metaphor to describe anything that is: impractically large, obsolete and or bound for extinction. No other kind of dinosaur symbolizes this better than a sauropod. These gigantic herbivores can be an universal sign of peace: harmless, friendly giants of fascination. They were really, really huge! The largest walking animals ever deserve an emoji. The whales got one, too. Sauropoda are one of the most iconic kinds of dinosaur and absolutely unique in shape and size. Follow our footsteps and be part of the journey! 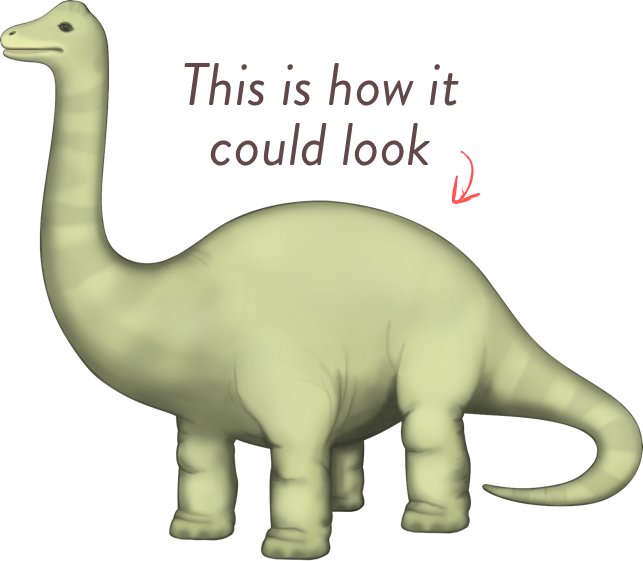 October 2017: 🦕 All major emoji fonts now contain the sauropod dinosaur emoji. 📱🙌 If you can't see it yet, update your operation system. The Emoji Subcommittee works on a proposal 📓 to consolidate dinosaurs and extinct animal emoji requests. »That consolidated proposal should come before the committee over the summer and your proposal will help in making a good case for a dinosaur emoji.«, a member ☝️says . Two different dinosaur proposals 📗📘 and one extendend comment 📝 on these gets discussed by the Emoji Subcommittee during their Q2 2016 meeting. The decision is made to postpone the decision ⏳ and come back with a more general solution for (extinct) animal emoji. 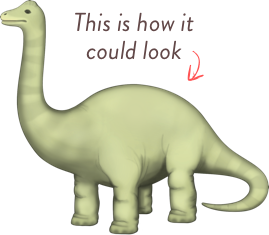 February 2016: Sauropod draft We still miss the dinosaurs. First sketch ✏️ of the friendly sauropod you see on this page. We promise to not send you any spam! Who's actually deciding on Emoji? The Unicode Consortium. They work amongst other stuff on IT standards that make sure that all kinds of different characters and languages are displayed correctly on your computer and mobile. Emoji are just a small and (relatively (!) unimportant) part of their work. Is it a good idea to mass-email people to make the emoji happen? NO. Definitely don't! Not only because petitions for emoji are not a criterion for them (good!) at all but also because it distracts them from some really important work. Better share this page. And in case you want to learn more about the emoji proccess check out »Meet the 63-Year-Old in Charge of Approving New Emoji« from time.com and »Who Controls Emoji Anyway?« from Mashable. What's the idea behind dinosauremoji.com? We're great dinosaur fans. We're great emoji fans. And we're just REALLY, really excited that a #DinosaurEmoji seems to be possible. This website is for everyone else who thinks alike. And of course it is adfree and nonprofit. We'll update the timeline as soon as we hear something new. Follow us on social media or get the newsletter and we'll ping you! Got any questions? Connect with us on Twitter or Facebook! Anyone can submit a proposal for an emoji character, but the proposal needs to have all the right information for it to have a chance of being accepted. Here are some examples from the sauropod proposal, one of two dinosaur documents the UTC received. The selection factors for inclusion are amongst others compatibility, image distinctiveness, completeness and expected usage level. To get a sense of the popularity of animal hashtag on Instagram I collected the number of times an animal emoji was used as an hashtag. Therefore I used the official name of the emoji (e.g., »Tropical Fish«). With this method, all animals with emoji named like »Wolf Face« are underrepresented since there are way more pictures tagged with »wolf« than with »wolf face«. Aside from these edge cases we still get a pretty clear picture: The hashtag »Dinosaur« is more popular than many other well known emoji like »ram« »octopus«, »rat«, »dolphin«, »snail«, »scorpion«, »whale«, »koala«, »crocodile« and many more. Also the Google search volume (image search, global) for »dinosaur« is constantly higher than other emoji animal with comparable Instagram usage (see above). Another criterion for the UTC is persistence. And this makes total sense, you don't want a keyboard with thousands of emoji nobody uses (anymore). But what about dinosaurs, are they just a short-living trend? Help us spread the word & make it happen!